Join the global movement to give back and support STEM education! Donate to SJR and participate in #GivingTuesday on November, 27th. 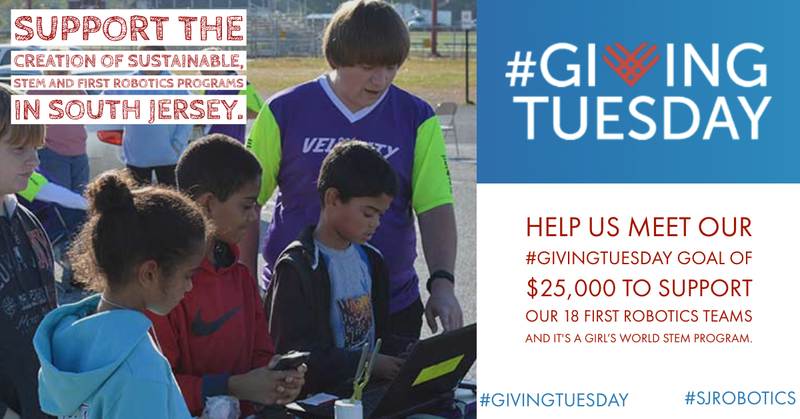 By supporting South Jersey Robotics this #GivingTuesday you not only help to support STEM education in South Jersey but you become part of a global movement of giving! Last year charities participating in #GivingTuesday campaigns raised over $300 million dollars! Help SJR be part of that and donate today! Help us meet our #GivingTuesday goal of $25,000 to support our 18 FIRST Robotics and It’s a Girl’s World STEM programs. There are 61,000 school-aged students in the tri-county area where access to STEM-related programs is limited. South Jersey Robotics (SJR) is trying to change that. SJR, working with school districts and communities, supports 18 FIRST teams and the It’s a Girl’s World program. These programs help students build lifelong skills, beyond engineering and robotics, such as public speaking, project planning, time management, business planning, and teamwork. These skills help them to expand their horizons and help them be successful in life. SJR youth who participate on an SJR sponsored FIRST® Robotics Competition teams become eligible for over $50 million in college scholarships from FIRST®. Additionally, many SJR students are recruited for internships and jobs by top colleges and major companies like DuPont, PSEG, and Boeing. These internships along with their experience with FIRST® help them to develop confidence and pursue their dreams.